This is the only non-original recipe I’ve posted. It belongs to a very dear friend of mine, with whom I’ve had a great many good times, some of which included the baking of these very biscuits, as well as some not-so-good times. She is one of my favourite people on the whole planet. 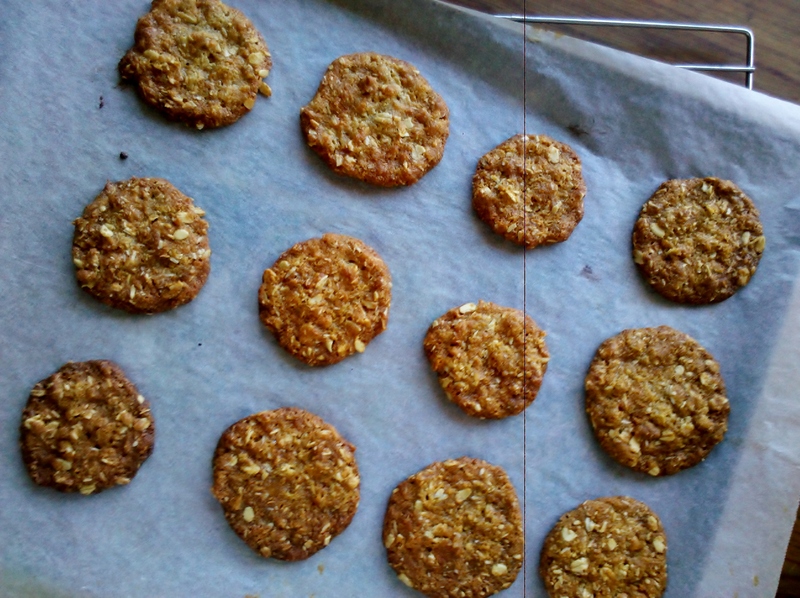 As far as I’m concerned, this recipe makes the very best ANZAC biscuits, crisp around the edges but chewy in the middle, just how I like them. I am reproducing the recipe here for you today with her permission. I don’t recall ever using anything but the wooden spoon to measure the golden syrup when baking them together. So, though I faithfully transcribed the recipe we baked together, I don’t think I ever got quite the same result. As such, in the recipe below, I’ve recommended twice the quantity of golden syrup. When measured properly, I think the result is nearer those we made together. As I said, she and I have made these together at her house at the base of the Grampians on many occasions. They regularly fill the household cookie jar to be raided for morning tea. But I have made them on many occasions myself, to send in care packages to friends serving on overseas operations with the Australian Defence Force. In intriguing moments of gendered identity, I would pull out my blue bonds singlet, crack open a beer and bake batches and batches of biscuits, lovingly packing them with other Australian treats to bring a little joy to an otherwise dusty day for someone on the other side of the world. I have loved and lost soldiers who have served in Australia’s more recent overseas operations. Today as we commemorate ANZAC Day, I remember them, and reflect on all those who have served, and died serving this country. The last time I was in uniform for ANZAC Day was in 2011, when I travelled back to Tasmania to spend it with my grandfather who had been both an Army Signaller (as I was) and a Wireless Air Gunner in the Air Force. We spent the morning in Cygnet, very near where he grew up. 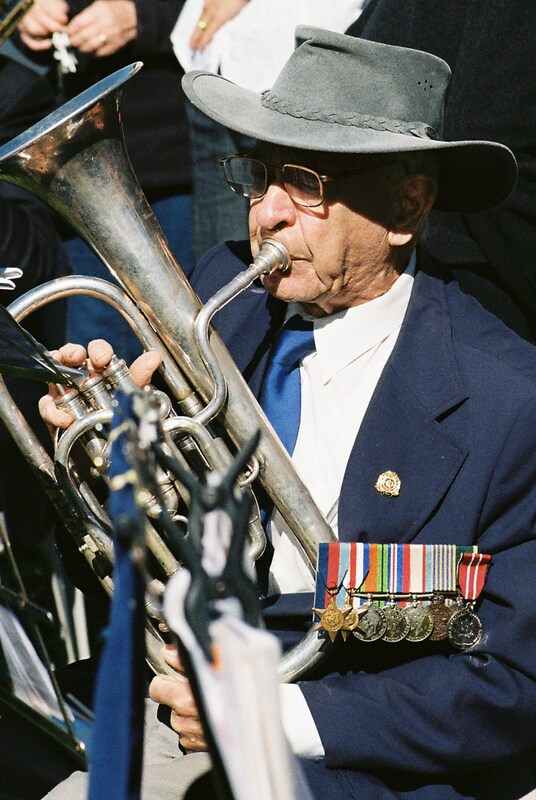 He played in the veteran’s band and I marched down the main street to their impressive tunes. It was an incredibly memorable day for me, highlighting the story of family. During the service, the names on the cenotaph of the locals who’d died were read aloud. Grandpa later told me there was one woman in the district who had lost three sons and her husband during the war. I also learned that of the hundred or so Australian recipients of the Victoria Cross, one of those recipients came from Cygnet. His name is SGT John Dwyer and he later went on to become Deputy Premier of Tasmania. The Huon Valley, in which Cygnet is located, is famous for its delicious apples so the day was capped of wonderfully when the local pub served apple crumple for lunchtime dessert. When I said to Grandpa how wonderful it was, he said proudly, “of course it is, it’s made with apples from the Huon!” I am glad that that son of orchardists has passed on a little of his appreciation to me. Combine the flour, coconut, oats and sugars in a mixing bowl. Add the golden syrup and butter together in a saucepan and heat until just melted. Dissolve the bicarbonate soda in the water and add to the golden syrup mixture (it will fizz a lot). Pour into the dry mixture and combine. Form spoonfuls of the mixture onto balls and arrange on lined baking trays, providing room for them to spread to more than double their size. As a guide, small biscuits, made using heaped teaspoons of dough will take eight minutes to cook till chewy and ten minutes to be crisp. Medium sized biscuits made with heaped dessertspoons of dough will take 10 minutes till chewy and 12 minutes to be crisp. Large biscuits made with wooden spoon sized balls of dough should be flattened a little before baking and will take 12 minutes to be chewy, and 15 to be crisp. Chewy biscuits will need to be cooled on the tray for a few minutes before transferring to a wire rack to cool completely. Crisp biscuits should be fine to immediately transfer to a wire rack. This entry was posted in Morning or afternoon tea, Thoughts and tagged ANZAC Day, Australia, Australian food, biscuits. Bookmark the permalink.